1 of 5 Heat gas grill to medium-high or prepare charcoal grill with medium-hot coals. Lightly coat grill rack with oil or nonstick cooking spray. 3 of 5 Generously brush veggies with 1/4 cup of the dressing. Grill for 4 to 5 minutes, until lightly charred. Carefully turn and grill covered for an additional 4 to 5 minutes or until vegetables soften and are lightly charred. Remove to a large serving platter and keep warm. 4 of 5 Cook pasta following package directions, about 10 minutes. Drain and toss with remaining 1/4 cup dressing. 5 of 5 Serve the vegetables on a bed of pasta. Garnish with shaved Parmesan and basil. 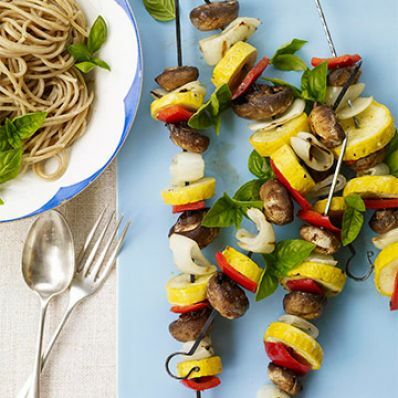 1 of 1 Assemble skewers; place on a platter and cover with plastic wrap. Refrigerate. Brush with dressing just before grilling.